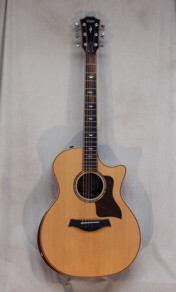 Taylor's new 814ce Deluxe is one incredible guitar! Chocolate-brown quartersawn Indian Rosewood and a silky Sitka Spruce top combine in Taylor's high performance Grand Auditorium shape for a hotrod of a guitar. This model features a thinner finish and different bracing pattern to make the guitar really come alive in your hands. Its response is articulate, clear and loud - perfect for many different styles. Decorated with maple binding, a wooden pickguard, and a beautiful inlay pattern on a naturally figured ebony fingerboard (not stained black so you can see the natural beauty of the wood), the new 814ce oozes class and elegance without looking overly fancy. The performance enhancing bonus of the cutaway and the newly designed high-end Expression System 2 electronics give you the power to take your sound from lush quiet lows to loud and full high volume punches. The Deluxe model 814ce adds Adirondack Spruce bracing, a Rosewood armrest (making the guitar very comfortable to hold and play), and the 21:1 gear ratio Gotoh 510 tuning machines. Includes a deluxe hardshell case and an expert custom set up for you at no extra charge.